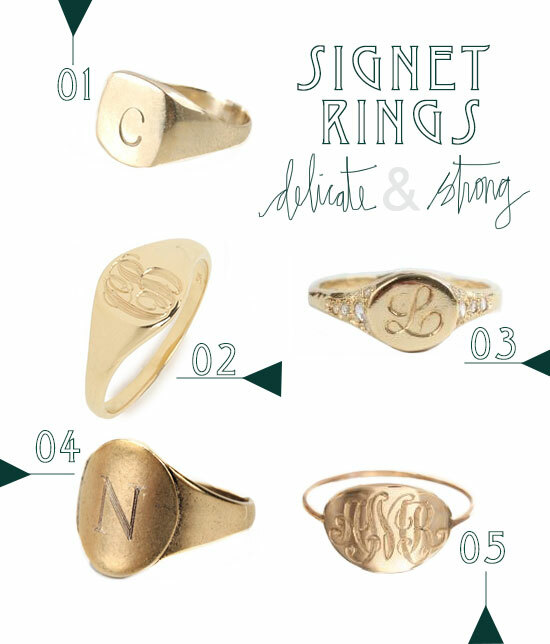 Delicate & strong, aren't signet rings the perfect balance? My husband's uncle proposed to his wife with his childhood signet ring bearing his initials. Isn't that sweet? A few years ago when we were traveling, I looked for one in a jewelry market, but could only find men's sizes. I stopped looking, but recently I saw #03 in the Catbird shop and it caught my eye. If I ever did make the purchase, I'd have to decide what I would engrave--my initials or my husband's? He thinks I should put a T for our last name. I think I'd want to put his initials. It's that balance of masculine & feminine that I love, delicate & strong. I think I like 02 the best, as long as it wasn't too big or maybe 03 without the diamonds. Which is your favorite?